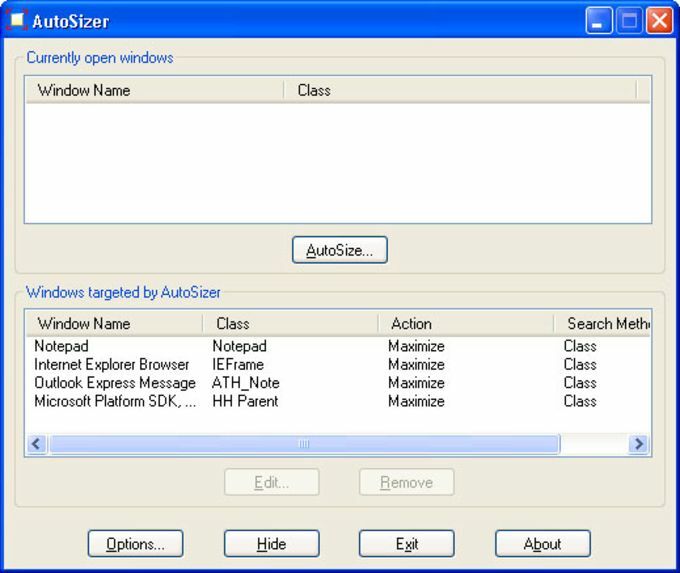 AutoSizer is a helpful, free program only available for Windows, being part of the category Software utilities with subcategory Windows Managers. Since we added this program to our catalog in 2006, it has obtained 15,192 installations, and last week it achieved 28 installations. About the download, AutoSizer is a relatively light software that does not require as much space than the average program in the section Software utilities. It's a software frequently downloaded in United States, Germany, and Bangladesh. It's available for users with the operating system Windows 98 and former versions, and it is available in English. The program version is 1.7 and was updated on 11/20/2008. AutoSizer automatically resizes any window you specify. For instance, some web browsers open up in a non-maximized window. Using AutoSizer, you can set those windows to automatically maximize every time they’re opened. It works with almost any program, including web browsers, Notepad, etc. AutoSizer stays running in the system tray (next to the time), so it stays out of your way while it works. For months my windows open minimized, not full screened. . For months all my windows open minimized, not full screened. After months of dealing with this myself with no luck with internet searches and everybody elses(pc engineer) resolutions i decided to try autosizer .. I was amazed at the speed and small size of down-load, it worked straight away.... Truly amazing ... A must have for anyone.11/10. The speed and small size of down-load. Size does matter. This programme overcomes that minor irritation of the half screen display followed by clicking on the maximum button. It works - what more can I say. What do you think about AutoSizer ? Do you recommend it? Why?